Doing a ranking list, we suppose, is meant to be a fun, carefree 15-minute project. Have a few moments to list out your Top 10 favorite breakfast cereals or mid-‘90s Saturday morning cartoons? Sure, no problem; then, post them on Facebook and let everyone else tell you how right or wrong you are. But let us say this – doing a real rankings list, one that takes longer than the length of a sitcom (without the commercials) and that people actually care about (sorry friends, no one really cares about your Top 5 favorite hummus flavors), is really hard. And it isn’t fun. Well, that isn’t exactly true – doing these rankings is fun for us, in a way, because we love doing them, and are passionate about getting them right (or, at least trying to). But in another way, they are stressfully un-fun, because we do care so much, and sometimes those of us in the War Room don’t always agree (and don’t sugarcoat it when we disagree). But, in the end, we are usually all in agreement that our list is as imperfectly perfect as it can be. And, at the very least, our rankings seem to always stir up debate, which we want. These rankings represent our well-researched, well-thought out opinions, but we love hearing your opinions as well. 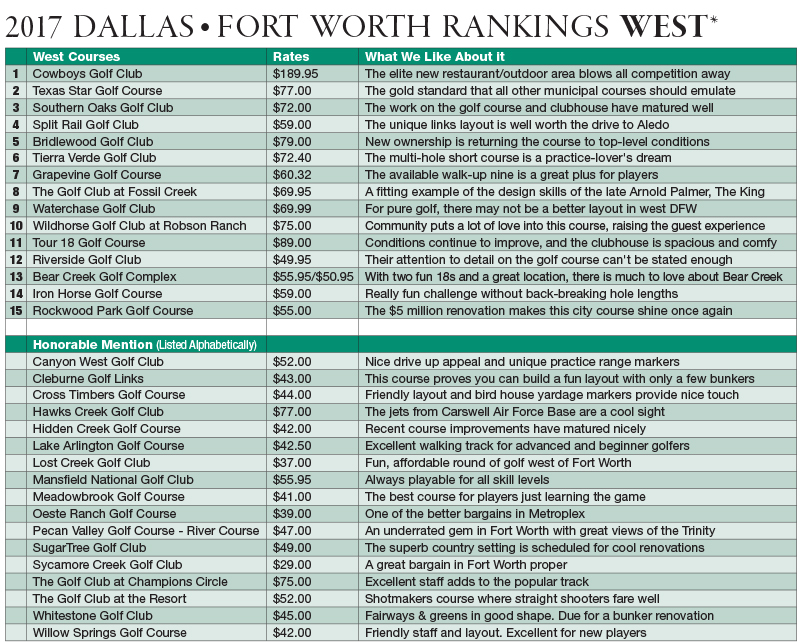 It was a strange year for the DFW golf industry, and by strange, we mean mostly normal. After a few years of wildly varying temperatures, monsoon-like rains, severe flooding and course closures, it was nice to have a calm year. It was, for the most part, predictable. It was wet and a bit mild earlier in the year, May and June were nice, and July, August and September were face-melting. Predictable. And predictable is good. So what does that mean for us? Well, it means no excuses, neither for us, the rankers, nor the golf courses. There aren’t any weird phenomena to fall back on in the event of poor conditions, so every golf course had a chance to be at their best. And those that were rose to the top of our rankings. We hope you enjoy the 2017 Best of Public Golf Rankings. There are some surprises in store, and a whole lot of really good golf courses. We hope you have as much fun reading and debating them as we did ranking them. And, as always, we’d love to hear your own rankings, so don’t be afraid to call us. Surprised? Yeah, neither are we. This must be how all basketball fans outside of Massachusetts felt in the late 1950s and 1960s, when the Boston Celtics won 11 NBA championships in 13 years and pretty much made all other teams look like middle school C teams. This is the easiest part of our entire job for the whole year. There are some good golf courses in DFW, and it only takes about 2 seconds (depending on how fast we type) to fill in the No. 1 spot. Cowboys Golf Club is so good, so lavish, so upscale, so fun to play that it is borderline unfair to the other courses. But, don’t think that the crew at Cowboys isn’t working hard to earn this title (for like the one-millionth year in a row), because they are the hardest-working group in the business. Every single detail at Cowboys is meticulously placed, manicured and maintained to the nth degree, so as to create the perfect experience for guests. And, throw in the newly revamped restaurant area and outdoor patio that opened up last year, and you’ve got a champion that has not only maintained its stronghold on the top spot, but actually put more distance between it and its competitors. There isn’t much more we can say about the greatness that is Cowboys Golf Club that we haven’t said a dozen times before, so we will go ahead at let you all bask in their magnificence. Ladies and gentlemen, the 2017 Best Overall Golf Course – Cowboys Golf Club. It has been more than a year since Old American Golf Club turned the flooding into a positive and softened their golf course, and now the layout is really hitting its stride, a perfect blend of toughness and playability. The club continues to push the competition in amenities as well, as Chef Nick Baker continues to turn out delicious, farm-to-table dishes, enhanced by produce grown right outside the clubhouse. For the last few years, the only thing holding back The Tribute Golf Club was the Bentgrass greens, which had grown a bit old. This summer, they replaced them with beautiful Bermuda putting surfaces, and the reviews have been nothing short of spectacular. As for the homage to the U.K.’s greatest holes, even if you don’t recognize them all, the course is still a blast to play. Heritage Ranch Golf & Country Club is such a good golf course, it is downright criminal if you’ve never made the trip to east McKinney to play it. The two nines are a beautiful juxtaposition, with the front winding through the trees, and the back being more open and length. The service is also top-notch, starting with the greeters that meet you at your car, all the way to the starter on the first tee, and the clubhouse is large and stately, but also comfortable. We’ve always maintained that Tour 18 Golf Course in Flower Mound has the bones and layout to be the best course in DFW. On that track, you get replica holes from Augusta National, Southern Hills, Oakmont, Medina, TPC Sawgrass, Pine Valley, Doral and more. In the past, however, conditions have always held it back. Well, this past year, course management has really stepped up and worked hard on conditions, both on the course and in the clubhouse, turning Tour 18 back into a true must-play course in North Texas. On the East side of town, there isn’t a golf course that personifies the word “luxury” more than Coyote Ridge Golf Club. It is the closest thing in Texas to the luxurious, pampered feel of a Las Vegas golf course. Everything is top-notch, from the greeters in the parking lot to the food and the upscale restaurant. And now, the golf course is starting to match the elite level of service, as the superintendent is really shining, especially on the greens. 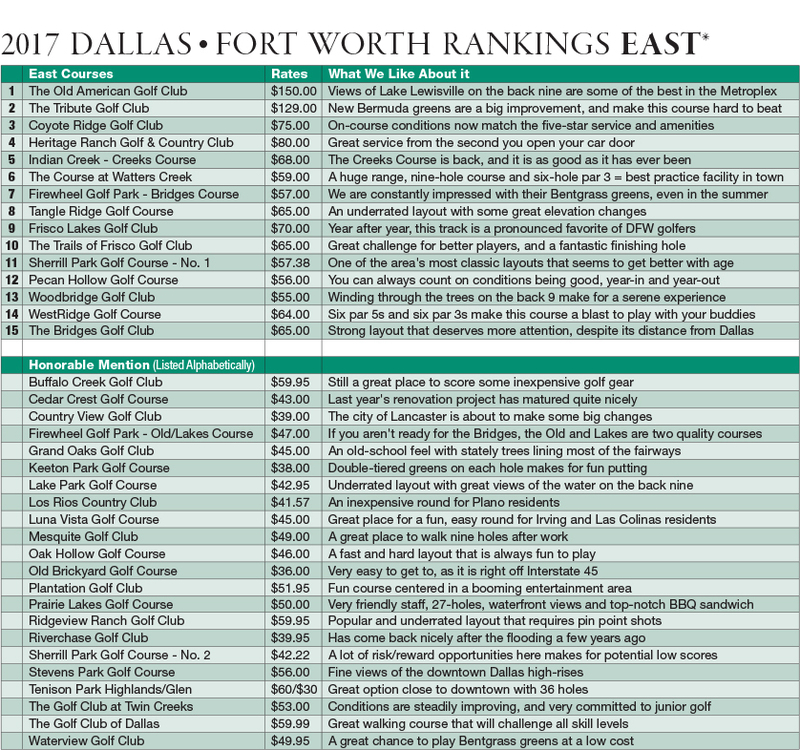 For the third year in a row, Frisco Lakes Golf Club has earned a place near the top of the Luxury category with another stellar season. The course has two distinct nines that make it a joy to play, and while the layout is a fun one, it isn’t overly taxing, making it attractive to all levels of golfers. There are great views of the ninth green from the clubhouse patio, a great place to enjoy food or a beverage after your round. Another year, another victory in the west side Luxury category for Texas Star Golf Course in Euless. Texas Star has, for a long time, been the gold standard when it comes to municipal golf courses, and all other cities in DFW should take note of the quality of this city-run beauty. The course winds through trees and subtle elevation changes, making every hole unique. Plus, the country-style, down-home restaurant in the clubhouse is a great place to eat, whether you are playing golf or not. Making the jump up into the Luxury category is Southern Oaks Golf Club in Burleson, and it immediately flexes its muscles as a leader of the pack. The grand experience that is Southern Oaks is the result of multiple years of improvements and work on the golf course and clubhouse, which now provide a one-two punch that can’t be matched in south Fort Worth. The outdoor patio, especially, is one of our favorite features of the facility. Also joining this category for the first time is Flower Mound’s Bridlewood Golf Club. One of the most popular courses on this list among DFW avid golfers, Bridlewood underwent an ownership change early this summer, and the process has resulted in a golf course that is better than ever. Conditions during the summer and fall were flawless, and work has already begun on improving the clubhouse and eating areas. After a long, sorrowful closure, Indian Creek is back, and the Creeks Course at Indian Creek has quickly reestablished itself as the best course east of Highway 360 in the Premium category. The new management toiled long and hard after floodwaters receded to return the Creeks Course back to its former glory, and they have succeeded. It is a fun layout with some nicely framed holes on the front and a great series of finishers on the back. Located way down south in Grand Prairie is arguably the most friendly golf facility in DFW, Tangle Ridge Golf Course. We say it every year, but the entire staff at Tangle Ridge is the most courteous group of people we’ve ever met, and they strive to leave a great impression on every player. The course is smile-inducing as well, with some great elevation changes (especially on the par-5 eighth hole) and some fun holes that wrap strategically around water features. The Trails of Frisco has established itself as the ultimate gamer’s golf course, as it can (if you want to play the back tees) present a very stern challenge to a skilled golfer, which is part of why we like it so much. It is also one of the least neighborhood-y neighborhood golf courses in DFW, as the designers did a great job concealing the houses as much as possible throughout the course, giving the layout an isolated feel, despite being in the middle of a neighborhood. We say it almost every year, but the 6-6-6 layout at WestRidge Golf Course makes for one of the most fun and unique rounds of golf in the area. The Jeff Brauer design employs six par 3s, six par 4s and six par 5s, presenting fun challenges on almost every tee box. Plus, with all the par 5s, birdies are flying around (no pun intended) left and right, making WestRidge a great golf course for your weekly betting round with buddies. On the west side, Grapevine Golf Course makes the leap up into the Premium category for the first time this year, and quickly grabs hold of the top spot. With 27 holes (including the daily “walk up” nine, which we love) that are always in stunning condition, Grapevine would dominate almost any category. But at only $60 and change for a Saturday morning round, you almost feel like you stole something after putting out on No. 18. As with Southern Oaks in the Luxury category, The Golf Club Fossil Creek in Fort Worth has steadily climbed our rankings the past three years due to a strong recommitment to course conditions. Designed by The King (Arnold Palmer), the bones have always been good at Fossil, and it is great to see that now the conditions are worthy of the late golf trailblazer, year-in and year-out. If we were breaking these rankings down to just pure golf, everything else forgotten, you’d be hard-pressed to find a better track in the Fort Worth area than Waterchase Golf Club. From the day is opened almost 20 years ago, this Ralph Plummer design has always been an A+ layout, with great par 5s, challenging par 3s and a series of par 4s that all differ from each other. The clubhouse may not be great, but for just golf, this one is tough to beat. Situated in Allen, not far off Interstate 75, The Courses at Watters Creek is arguably one of the most complete golf facilities in the Metroplex. Not only is it an exceptional golf course, but also has a giant driving range, multiple putting and chipping greens, a nine-hole course of par 4s and par 3s, and a separate six-hole short course. It is a place where you could easily spend 8 hours and not play a hole twice, and the best place in the area to hone your game. In DFW, playing on Bentgrass greens is a rarity, especially at a great price, but you get both on the Bridges Course at Firewheel Golf Park. We truly are amazed each time we step onto the golf course at the condition of the greens, even in the summer, when Bentgrass usually struggles. Add onto that the fact that there are three distinct nines on the property, and you have a facility that really offers some country club-type conditions at a great public golf price. Rounding out the Mid-Priced category on the east side is the classic No. 1 Course at Sherrill Park Golf Course in Richardson. The layout is a timeless, old school assembly, beefed up by a $2 million renovation in early 2016. As the course has grown in to the new digs (reshaped greens, reworked bunkers and 113 additional trees), is has truly rounded into form. On the west side, the top dog in the Mid-Priced category is Aledo’s Split Rail Links & Golf Club. The new clubhouse and giant outdoor covered eating area really add a nice touch to this already-stellar facility, but it is the golf course that is the star. A unique links(ish)-style layout with great use of mounding, bunkering and the surrounding trees, Split Rail is 100 percent worth the drive to Aledo to play, and worth a trip back to play again. Now multiple years removed from the golf course hell it was in 2013, Bear Creek Golf Club has reestablished itself as a fan favorite and must-place golf course for all central DFW residents. With two 18-hole layouts that do a good job of utilizing the subtle elevation changes, both the East and the West courses are enjoyable to play. Located along Interstate 820 near Haltom City, Iron Horse Golf Club is one of the shorter courses on this list, but it still provides a fun challenge for any player. The train theme and train cars parked around the course are a nice touch, and the par 5 that runs along the highway may be one of the better holes in the area. Every time we head out to Riverside Golf Club, we are amazed at how meticulously manicured and well-maintained every hole is. Each tee box is perfectly kept, the fairways are nicely mown, and the edging around the greens and bunkers look painstakingly exceptional. For under $50, some course may cut corners in their maintenance, but not Riverside. Their continued commitment to on-course excellent is why they top this category. The city of Fort Worth undertook a huge project when they decided to overhaul Rockwood Park Golf Course, and more than a year later, the $5.1 million renovation really makes this golf course shine again. Sweeping views of downtown Fort Worth and the Trinity River have always made the property beautiful, and now the golf course matches the pretty aesthetics. As they got older, the Bentgrass greens at The Tribute Golf Club began to wear down (as any Bentgrass green in Texas will), and this summer, the course got a complete green overhaul, with the old Bentgrass being replaced by pristine Bermuda. Now, the greens roll as pure and steady as any in DFW, and look as good as they putt. What was once slightly holding The Tribute back has now become the course’s crown jewel, which is why we believe it is now one of the best facilities in the entire Metroplex. No course went through a more expansive renovation than Fort Worth’s Rockwood Park Golf Course. Redesigned by Colligan Golf with a $5.1 million price tag, Rockwood received a much-needed expansion (from 6,350 yards to 7,053 yards), a completely updated irrigation system, new Bermuda fairways and greens and renovated bunkers. The course also houses the First Tee of Fort Worth in a very nice facility, which adds to the course’s allure. We chose not to rank Sky Creek Ranch Golf Club this year (read more about that below), but the new Bermuda greens the course installed this summer and unveiled in October truly are a thing of beauty. Much like The Tribute, the old Bentgrass greens were nice, but a bit worn down, so the injection of Texas-friendly Bermuda grass should make Sky Creek truly a magnificent course year-round, especially during the summer months. We talk to a lot of people that have heard of Pine Dunes Golf Club in Frankston, but have never been, and we highly encourage them all to make the trip. If the course were located in Dallas, it would probably be one of the best-ranked clubs on our list. Even being about 90 minutes from downtown, it is still a heavy hitter, and a must-play for any avid golfer. The layout is so unique to North Texas, and there are ample living accommodations for stay-and-play options, which we also highly recommend checking out. 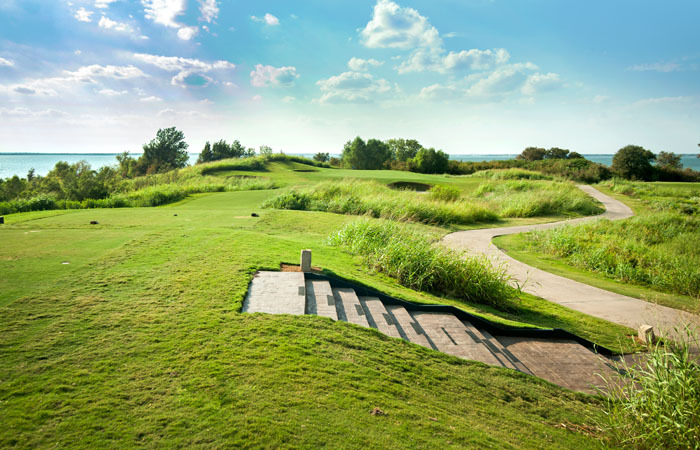 The Links at Land’s End is under new ownership, who have re-done all of the bunkers on the course and completely renovated the clubhouse, making the great views around Lake Fork even more special. Scenery plays a huge part of the experience at Land’s End, as the views are beautiful, and the visible wildlife is abundant all across the golf course. Another huge plus? Lake Fork is one of the best bass fishing lakes in the country. While Keller’s Sky Creek Ranch Golf Club technically reopened in early October, and in enough time for our rankings, we wanted to give their new greens some time to get settled before comparing them against other courses. But, we did get a chance to see them last month, and we can say with conviction that the decision to replace the Bentgrass with Bermuda was an excellent one, as the greens truly enhance an already wonderful golf course. We can’t wait to see what they are like next summer, once they have had a chance to mature.